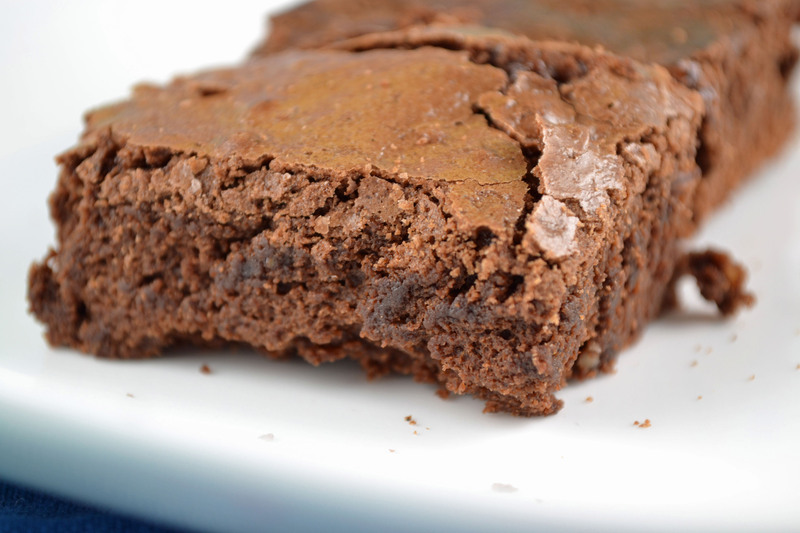 If there’s one recipe that my grandmother is most well known for, it’s brownies. Search for Paula Peck recipes on the internet and this brownie recipe is one of the first to pop up. Many of you may have seen Mark Bittman’s recent article, “Fear of Frying”, in The New York Times Magazine that acknowledges my grandmother‘s cooking (and this blog!). But it was one of his much earlier articles where I found her amazing brownie recipe mentioned (“Truth in Fudginess“). I have to admit that my views differ somewhat from his. With an extra large sweet tooth, I don’t discriminate against those brownies with all the bells and whistles (as long as they’re not dry and crumbly of course). However, the beauty of my grandmother’s recipe is its old-fashioned simplicity. I’ve experimented using semi-sweet chocolate instead of unsweetened, and the cakey brownie that emerged was just not the same. This is a classic, no-fuss recipe with minimal ingredients that creates the perfect, fudgy, sweet, chocolaty brownie that makes you want to devour every last crumb. Preheat oven to 325 degrees. Grease and lightly flour an 11 x 13 baking dish or pan. Melt chocolate and butter together over low heat and set aside to cool slightly. Beat eggs and sugar together until light and fluffy. Add vanilla. Stir in chocolate mixture, then flour, salt, and nuts. Mix only until combined. Pour into prepared dish/pan. Bake about 25 minutes until top looks dry. Cool before cutting into squares or bars. Adapted from "The Art of Fine Baking," by Paula Peck. No, 325 degrees is correct. This is directly from Paula Peck’s original recipe which is also one of her most well known and is often repeated and written about. Sorry you had trouble. Do you have an oven thermometer? Every oven is different so perhaps your oven is off temp. I would also recommend double checking your ingredients (missing an egg can also cause under baking). Hope this helps. theyre in the oven right now ant it smells AMAZING!! !